“Essay, a term from written literature: unity of science and art; unity of social and individual knowledge,” Harun Farocki wrote in a first draft of the project Erzählen. 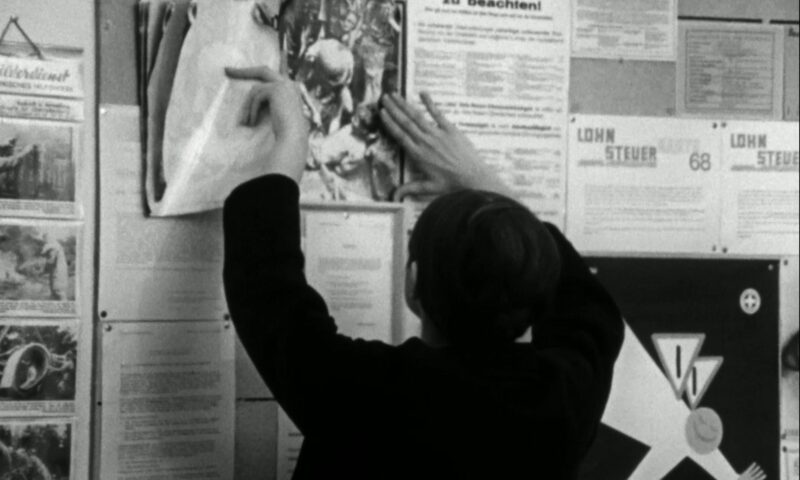 “About Narration” follows two people (played by Engström and Farocki) investigating their respective subjects: One is tracing the involvement of the German heavy industry in the rise of Nazi-Germany, the other is interested in the fate of Larissa Reissner, a young Soviet writer and revolutionary. Both of them struggle with the question of how to organize their research and find a narrative structure. Their paths cross, and the film turns into an essayistic interrogation of structuralist narratology. In the context of this programme, Erzählen, produced by Annelen Kranefuss and Christhart Burgmann for the WDR department “Literatur und Sprache”, shows that it was not only the film department, that allowed for experimental and playful forms to blossom. “It should be possible to include anything as in the Nature Theater of Oklahoma” (Ingemo Engström).